Whitetail World Forums » WTW Member Section » Classifieds » Two Bows For Sale Select A Forum INFO ON NEW FORUM » Making the Move... It's All About The Whitetails » Whitetails "Catch All" » Got Pictures? Got Video? Got Questions? » Food Plots WTW Member Section » News and Notes » Introductions » Member Hunt Journals » Contests and Challenges » Classifieds » The Spot for Jokes and Games Some "Other" Stuff » Equipment / Gear / Reviews » Turkey Talk » Other Critters » FAQ's and "How To's"
I bought a new bow so I need to sell a couple or my wife is going to make me sleep with the dog in the garage....not kidding. #1 - A 2009 G5 Quest XPB. Included with the bow is a QAD HD Pro rest and the matching sling (to the string). The sight and stab are not included in the price but if you really want them, let me know and we'll work something out. The bow is currently set at 28" and 70#'s. I am asking $350 tyd. 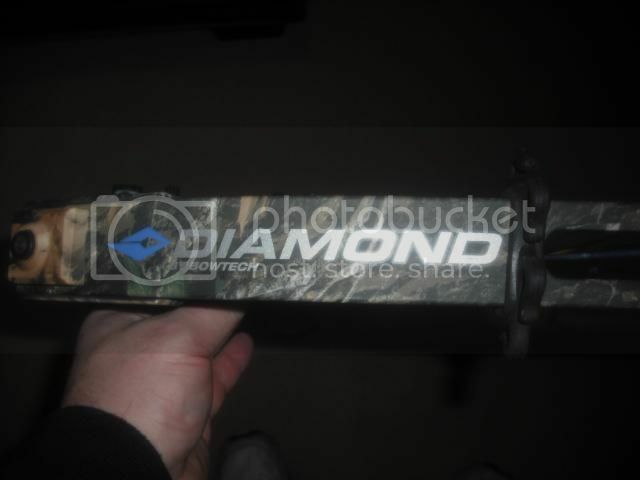 #2 - 2007 Diamond Black Ice. Included with the bow is a QAD HD Pro rest and the matching sling (to the string). The sight and stab are not included in the price but if you really want them, let me know and we'll work something out. The bow is currently set at 28" and 70#'s. I am asking $325 tyd. Great deal on these bows. I have seen them and they are in excellent shape. How many of you guys from Heyworth, Bloomington area are on WTW anyway ? Nobody needs a new bow or a backup????? If it was a mathews maybe I could spare the money those are some nice bows!